An enjoyable yet unchallenging evening – you’re guaranteed fun. 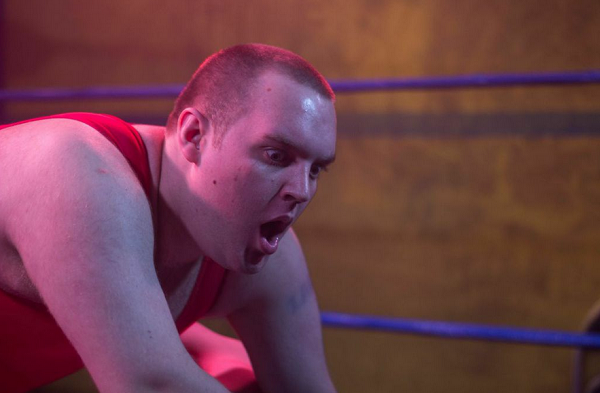 Lardo, the story of an obese Scottish wannabe-wrestler, is currently being premiered above the Old Red Lion Pub in Angel, Islington. Walking into the venue, you are taken aback at how joyfully hostile small-scale venues, such as this, are to the idea of the more traditional theatre and reminded again of how incredibly intimate they can be. No ham acting in the aisles in a desperate attempt to make a connection with the audience here. In the delay before it started, I realised that all four of the grimy, battered-looking walls were in fact part of the set and not, what might be described by estate agents as an ‘original period feature’. “They always start late here”, I was told by the man to my left. And with that, almost as though in objection, loud, bassy music signalled the start of, what was to be, an engaging and enjoyable 90-minute production. Robert, stuck with the nickname Lardo from a young age, wants to follow in his dead father’s footsteps and become a wrestler. He’s an unlucky fool but exuberant with naive enthusiasm for the sport and finds his Lardo character to be popular in the ring. The league, Tartan Wrestling Madness, is run by the shady character of a chap named Stairs, who, it transpires, has a violent history with Lardo’s father. We’re introduced to several other characters, including a Health and Safety inspector who, somewhat implausibly, seems to appear in every other scene, but none of their stories really come to the fore. Although the characters were often charming, the character of wrestling star/single mum Mary in particular, there were several moments that veered dangerously close to pantomime. I would put this down to Stone’s immaturity as a writer. Key interactions between characters, such as Lardo’s ex announcing her pregnancy to him, were over with minimal, clumsy and unrealistic dialogue. In the same vein, the plot unravelled with some blindingly clear signposting (prophetic warnings, hubris, the usual). It’s a promising first step into the theatre for the script’s writer, even if not all of the punches land. Overall, an enjoyable yet unchallenging evening in one of London’s many historic pub theatres; it won’t blow you away but you’re guaranteed to have fun.